Light-weight tops, slacks, skirts and dresses are my go to pieces this time of year. Remember, when wearing skirts or dresses to the office make sure they are no more than 1 to 2 inches above the knee. When picking tops for the office, be sure to skip showing too much cleavage. Heeled sandals are great to add to your summer wardrobe if your dress code allows open-toed shoes. 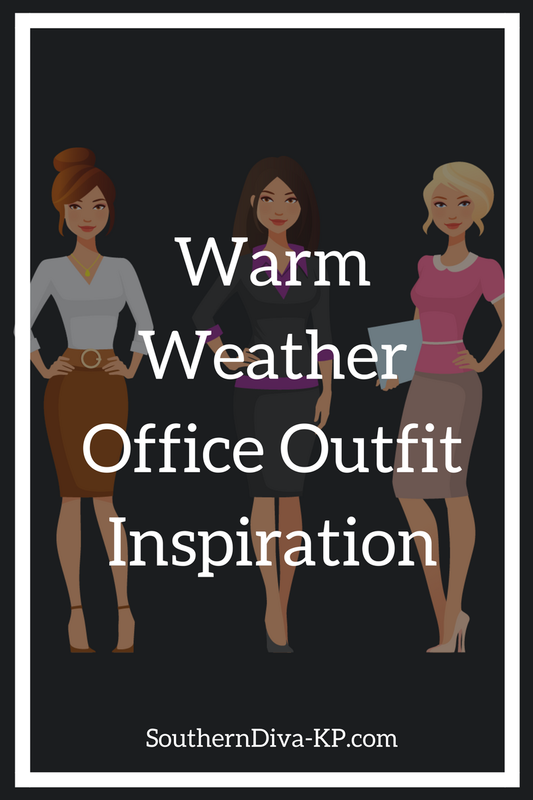 Here are a few cute summer outfit ideas that you can use to build your summer office wardrobe. Spring/Summer office Look #1 is simple and cute. I paired a striped top with a pair of khaki slacks and blue pumps. Look #2 a cute striped, wrap top with black slacks. Look #3 is nice floral patterned pencil skirt, wrap top, and blazer. Look #4 is a cute, patterned dress with accessories. The dress will bring a little personality to your office style but I would tone it down by adding a cute blazer. Your office wear does not have to be boring. I am a believer that you can be both fashionable and office dress code appropriate. If you have a few basics pieces it is definitely achievable. My ebook, How to Slay at the Office will help you do just that. Be sure to also check out my Get Your Closet Straight ebook. This small guide is packed with tips and resources to help you have an amazingly organized closet. It is easier to put your outfits together when you can see what you have. Like this post and want to see more like it? Subscribe to SouthernDivaKP and have the posts and any updates sent straight to your inbox. As a bonus, when you subscribe you will receive a free copy of The Style Guide.